We all know pride cometh before a fall. I was so proud of myself for getting my projects sorted and ready to go that I forgot about the consequences. The projects are striking back, starting with this one. I made the four blocks as part of a demonstration. Rather than stick them in the orphan block bin, I put them in a bag with some other fabric for a charity quilt. I envisioned a charming quilt for a little girl, what with the pink flamingos and all. As I was unpacking the the bag, I found this. 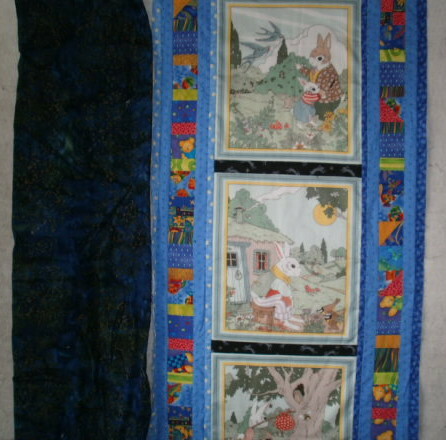 This does not fit the theme of “charming quilt for a little girl” and is in fact not yardage but a panel for making boxer shorts. Don’t ask me where I got it, or why it found its way into my flamingo block bag. It just did. The palm trees and pale fish fabric also found their way into the bag, and although they go with the theme, I’m coming to believe they want to be in an art quilt all on their own. So, instead of one project I’ve got two, and a shark panel. Oy. Is There A Modern Quilter in Me? I ran across some visual aids Ann Anastasio and I used in a workshop a long time ago. We were illustrating how you could adapt traditional blocks with contemporary fabrics to come up with some new design options. If we had only used gray or white backgrounds, we could have founded the Modern Movement. Ah, well. This is Diamond in a Rectangle, made up of four half-rectangle triangle units. Most of us can piece half-square triangle units in our sleep. It isn’t hard to stretch out that square, and look at the result. Most of us can also piece Log Cabins in our sleep. This is what happens when you do one round of logs in varying widths. Easy-peasy, and you can highlight a focus fabric. The slice-and-dice technique was one of my favorites for adding a color pop while still keeping my focus fabric prominent in the block. I must admit I haven’t used it in a long time, but I imagine it will appear in my next project. Whatever your go-to techniques are today, consider resurrecting things you used to do. Sometimes everything old really is new again. I made one round of auditions. By photographing the piece over a period of days – and then looking at those pictures when I posted them on Instagram – I was forced to think about design elements in a deeper way. I also thought about what I was trying to say with these challenge fabrics, as well as what the fabrics were trying to say to me. Some of the fabrics from the first audition are still yammering at me. The cow tried really hard to fit into the start of the project, but didn’t make the cut. However, she and some fabric with other cows will go in the bag. Perhaps she’ll appear in one of the additions to the top. I finished the tunic (well, almost) and two scarves. Use fabric that hides seams. 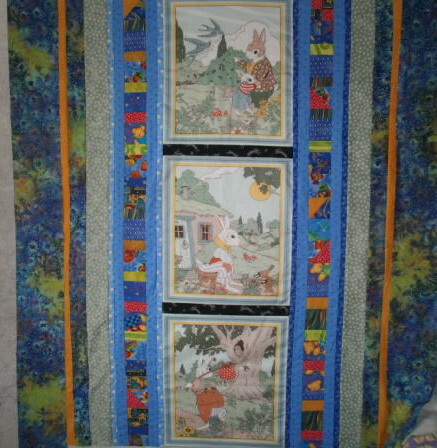 When I was learning how to quilt – by hand and by machine – I was advised to use busy backings that would hide the thread. The dark blue silk hides the seams beautifully. As you can see in the picture, that back dart is barely visible. Don’t point out your errors. There are plenty in this tunic, but it’s comfortable and drapes well and I’m happy. If it’s there, it must be right. Mary Ellen Hopkins used to say that about fabric choice. Don’t explain why you used teal in a forest scene, orange in the sky, hunter green in a shadow. Likewise, I’m seriously considering angling the hem on this garment. That’s the way it hangs now, and it’s kind of a cool look. If you must use headstrong fabric, treat it with the same patience you would a cranky toddler. The silk hides seams beautifully, but stretches horribly (even with stay-stitching – thus the hem that hangs at an angle). Careful pinning can save a frayed temper, but acceptance is sometimes the only way to maintain one’s sanity. Iron that thing into submission. Good pressing technique is essential. My home ec teacher would have given her eye teeth if I had realized that bit of wisdom in school. Better late than never. If all else fails, distract the viewer’s eye with something fun. Despite fighting a ridiculously resilient bug (the kind that requires antibiotics, not a call to technical support), I managed to clear off my sewing table. That lasted about a day, and I couldn’t stand the empty space. So I started another project, and got far enough along to call it good. For that, I give thanks. 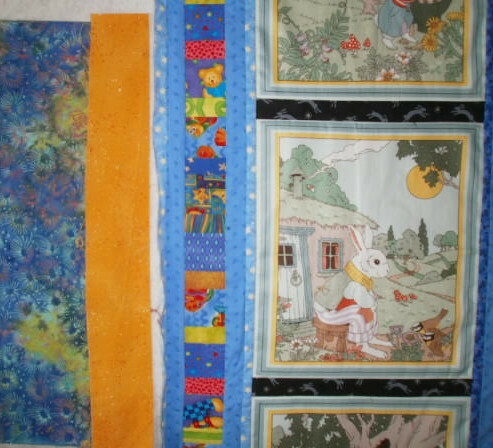 There are a few gift quilts I want to make. This is one of them. None of the quilts I have in mind are Christmas presents. I figured if I could make the tops and backs before the holidays, I would be more inclined to get back into the sewing room in January. It always takes a while to remember what I do around here at the end of a vacation or celebration, so having a project waiting for me is essential. The other reason I’m giving thanks is I think this is going to become my go-to pattern. I learned it as Twist and Turn. The whole thing goes together in a flash, and is ideally suited to my preference of letting the fabric do the work. I hope this Thanksgiving you can find many things, big and small, that you call a blessing. Thanks to good friend, writer and quilter Sally Kimball, I am closer to being finished with one of my Colors of the Vineyard challenges. She gave me a blue solid to use as an under quilt. I’m planning to hand quilt it (those marks are made with chalk that releases from the fabric easily – I checked first, then marked). Here is the lesson for the day – always bring your fabrics/quilts/threads/embellishments with you when choosing a companion piece. If I hadn’t had the little tree quilt with me, I would never have believed that the blue would work. I hope to be closer to finishing the other quilts in the series, especially the one based on Art Map Quilts by Valerie S. Goodwin, in a week or so. I brought the map quilt to my Art Critique group and received some terrific advice. My task is to make time to use that good advice. This is the perfect opportunity, now that it is the first day of fall and the temperatures are dropping, and before it gets too close to the holidays. The holidays are over, the house is quiet, and I am back in the sewing room. The center for a small quilt is finished – which is not a huge achievement given that I started with three panels. Still, all that is left is to find something to put on the sides. This is what I pull from the drawer. This is actually less profound than you might think. The sun set before I strong-armed myself in front of the sewing machine, which meant I was picking fabric under artificial light. I have learned to my horror that this is a dreadful idea. So, I waited until morning and discovered a much better combination. The part of my brain that wants to use up my stash kicked into gear, and I realized I could add at least one more small piece of fabric. This is how the quilt ended. Waiting for the light is always worth it.